Are you fond of wearing deep cut dresses or enjoy showing your fine collar-bone? You can add highlight this area of your body with a beautiful tattoo. With its distinct raised surface the collar-bone makes a great place for body art. You can get a small and cute design to show off when you wear something revealing, or a colorful and elaborate tattoo that just peeks above your collar-bone. 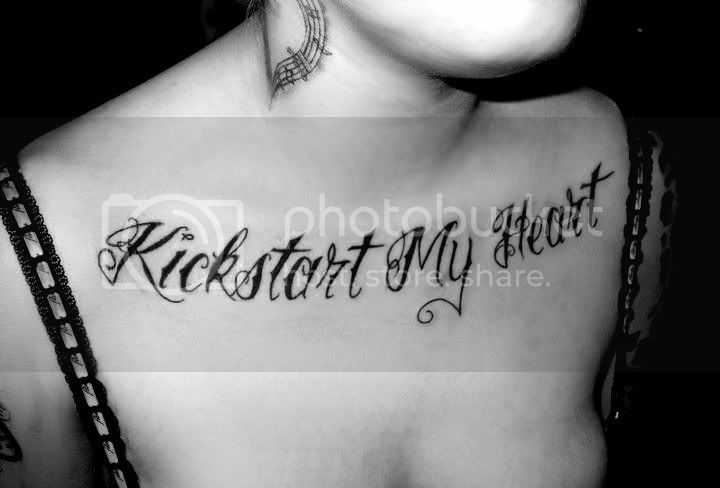 You can have words inked in running hand as a pretty collar-bone tattoo. Special words in a stylish curved font make a great collar-bone tattoo. A symbol that is important to you can make an interesting collar-bone tattoo. Get inspired by using your favorite life message in a collar-bone tattoo. You can get a pair of fantasy creatures inked on your collar-bone. Show off your deep cut dress with a beautiful flying birds tattoo. You can have a pair of beautiful dragonflies as your collar-bone tattoo. You can have a strong and inspiring message in a single color across your collar-bone. You can get inked with a meaningful statement in many colors on your collar-bone. A colorful heart and two roses make for a gorgeous collar-bone tattoo. Have a favorite saying or words that hold a special meaning? Get inked with those words. Instead of a long word, you can use simple initials for a basic tattoo design. Across your collar-bone you can get inked with a powerful statement. Express your creativity with a series of hands showing different gestures. Have a special person you cherish? Get a collar-bone tattoo as a reminder. You can have bright and beautiful sunflowers inked on either side of your collar-bone. Show your ape love with a cute monkey on a tree tattoo. You can get pretty leaves in green and gold near your collar-bone. Elaborate wings with a star can make a great collar-bone tattoo. A message in black written stylishly can be a cool collar-bone tattoo. Love cartoon character? Get your favorite inked as a collar-bone tattoo. A red and blue dragonfly can make a pretty tattoo for the collar-bone. A line from a book or song can be a perfect collar-bone tattoo. You can have a pretty flying bird as your collar-bone tattoo. A pair of colorful birds make a great collar-bone tattoo design. You can get numbers that are special to you inked on the collar-bone. A couple of nails being driven in make a realistic looking tattoo. Words in a beautiful and formal pattern look great across the collar-bone. Express how certain words are meaningful for you with a small collar-bone tattoo. You can have your favorite inspiring quote slanting down your collar-bone. A colorful tattoo at the center and a bold stars on either collar-bone make a great tattoo design. On your collar-bone you can get inked with inspiring words in black. Just the word ‘Clavicle’ in bold black can make an interesting collar-bone tattoo. 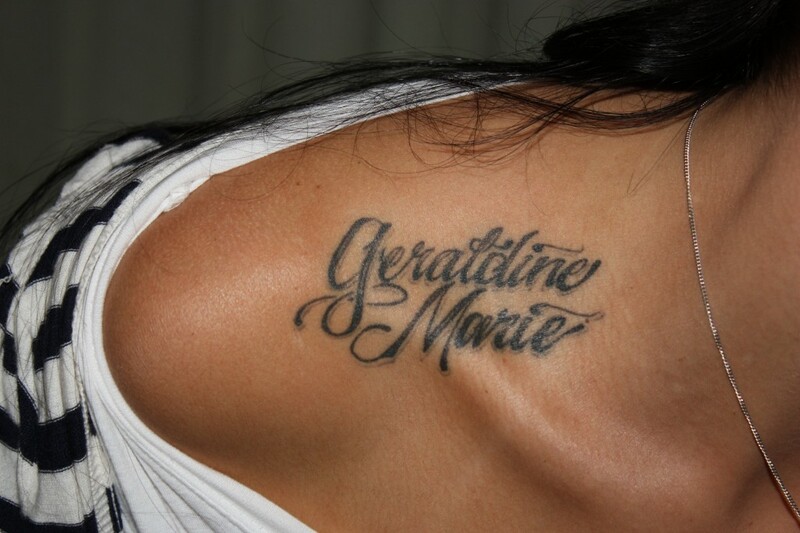 Your name can look great when inked on your collar-bone. Looking for a simple design? A flock of flying birds in a single color is ideal. An artistic Roman numerals design can be an interesting tattoo. Love your family? Express it with a small tattoo with the word ‘Family’. You can get a matching pair of large red roses as a collar-bone tattoo. An owl in a single color shade can make a cool tattoo for the collar-bone. The Chinese script also makes a fascinating collar-bone tattoo idea.